The above photo shows the internal layout viewed from above the rear panel. The square cans on the left are for the RF, mixer and local oscillator tuned circuits and the two PCBs on the rear panel are the AF amplifier and low voltage power supply regulators. The use of screened tuned circuit assemblies above chassis increases the construction costs a bit but greatly simplifies the under chassis screening while providing reasonable Q values. The original VFO is in the centre of the front panel and the modified wide band coupler is immediately behind the VFO. The small PCB in the centre is a 150v solid state regulator shown elsewhere on this web site. The AM, SSB and CW filters are mounted on the chassis towards the upper right hand corner and the three IF stages are mounted along the right hand side of the chassis finishing near the black mains transformer. The screened box contains the AM/SSB detectors and three BFO oscillators with the FM detector mounted on top. An additional mains transformer was required to supply the semiconductor circuits. A simplified block diagram is shown below less the power supply functions. a) The first tuned circuit in the Wide Band Coupler (WBC) has been changed to a bifilar winding to accomodate the push pull signals from the first 7360 mixer and adjustable trimmers have been added with access holes in the aluminium screening can to ease alignment. 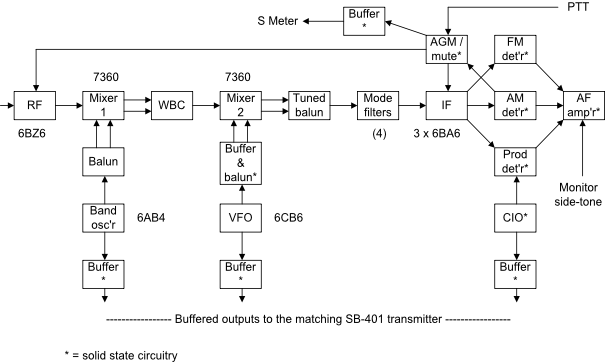 b) A tuned step-down tuned balun is used between the second 7360 mixer and the mode filters. c) The balun between the band oscillator and the first 7360 mixer is also used as the 1.8MHz band oscillator anode tuned circuit with the tuning capacitor removed on all other bands. Circuit details for the revised band oscillator and mixers/band pass filter may be found in Valve Circuits 1 item 7 and Valve circuits 6 respectively. I collect and refurbish/redesign Heathkit SB-Line amateur radio equipment because, although old by current standards, it was well designed in the early to mid 60s and is ideal for home constructors - you can get at everything without needing a microscope or a Ph.D. in mechanical engineering. The first thing that usually happens is that the outer case is removed and washed in the bath in warm soapy water to remove years of grime that gets trapped in the crackle paint. Then the real work starts. The classic Heathkit frequency conversion using a tunable first IF of 8.895 - 8.395MHz followed by a second fixed IF of 3.395MHz provides a good but not perfect platform for modern day HF band activities. However, the performance of valve receivers like the SB301/310 can be significantly improved if you are willing to expend some time and effort. The 6BZ6 RF stage was retained but with reduced gain. Additional Tx muting was added by raising the cathode potential of the RF stage on transmit. A 0/10/20dB 50ohm RF attenuator was installed. Both mixers were changed to the beam deflection 7360 with balanced oscillator injection to the deflection electrodes using broadband transformers - the VFO injection to the second mixer was buffered with a solid state amplifier. Both mixers use a balanced anode configuration and have preset balancing controls. The band oscillator output to the rear panel for an associated transmitter is now also buffered. An extra IF stage was introduced and all three amplifiers have AGC control to the control grids. A buffered IF signal is available on the rear panel for an external monitor scope. 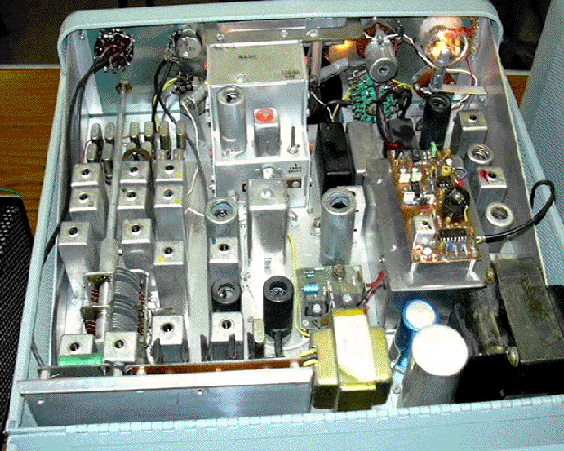 The AM, AGC and product detectors, BFO, BFO buffer and audio amplifier were replaced with solid state circuitry to reduce the space and power requirements. The AGC line is now also used for rapid muting and unmuting the receiver for full break-in CW operation whilst retaining an adequate but completely separate time constant for SSB/CW reception. A wide IF filter and FM detector module have been installed with a four position bandwidth switch. Keyed AF tone and own-Tx monitoring are available on CW with the level adjustable from a front panel control. The WARC and 160m bands were added. A multiway control lead with connectors has been installed between the receiver and matching SB401 transmitter. The receiver mode switch has been extended to include RTTY and FM. The original chassis was removed leaving just a 1/4inch (6mm) horizontal lip all the way round. A new top chassis plate was installed using 16swg NS4 half hard aluminium. The overall layout was changed to improve isolation and reduce interstage coupling. Additional lettering was added to the front panel using white Letraset and a clear retaining lacquer. 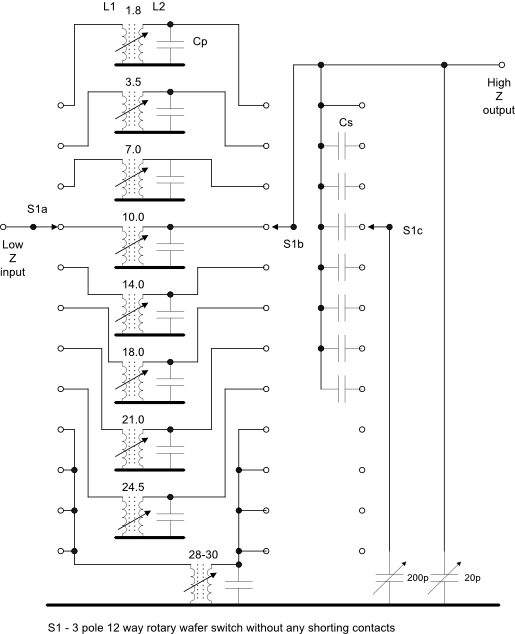 The following circuit shows the changes made to the original RF stage input preselector design in order to maintain a more constant LC ratio on each band but requiring an extra switch wafer. The RF output preselector and the band oscillator each require a two pole rotary switch and the band oscillator wafers use shorting contacts. Capacitor Cs allows a proportion of the 200pF variable capacitor to be utilised on those bands requiring a higher tuning capacitor value and on the 1.8MHz band Cs is replaced with a connecting wire. All coils are mounted in pairs of widely separated frequencies in large screened cans as can be seen from the picture above. This results in low inter coil coupling and reduces the risk of signal absorption by an unused adjacent tuned circuit. More to follow as time permits….